When you are in the process of helping your clients to lose weight you may find that the reasons behind their eating issues may be more complex than originally anticipated. Some people unconsciously retain their weight as a way of protecting themselves or their eating issues may represent a secondary gain to them. As a Hypnotherapist you will no doubt work through these causes with them and help your clients to remove or resolve any blocks in their emotional state. 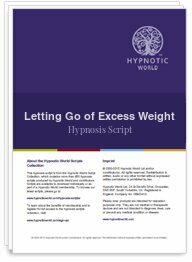 This Letting Go of Excess Weight script from Hypnotic World is suitable for use after this resolution has taken place to get your clients in the frame of mind to begin their new weight loss program and achieve a slimmer body.